If you're looking for a lightweight, carbon fiber water bottle cage to complement the beauty of today's exotic bicycles, then look no further than Speedplay's Nanogram Ultra Light Water Bottle Cage. The Nanogram Ultra Light cage weighs only 19 grams, but is inherently less fragile than other light weight carbon cages by virtue of its unique design. Made from unidirectional carbon fiber, the Nanogram Ultra Light's simple, elegant design positions the water bottle stop at the top of the cage rather than near the mount where it is most vulnerable. The Speedplay Nanogram cage combines this design feature with the natural resiliency of carbon to absorb the repetitive impacts of rough roads and from riders banging closed the water bottle top. As a bonus, the Nanogram cage includes lightweight aluminum fasteners and a BPA-Free Nanogram logo water bottle. 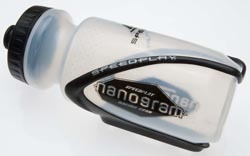 At 19 grams, the Speedplay Nanogram Ultra Light is intended solely for road bike use. However, a Speedplay Nanogram Cage is also available at 27 grams that is suitable for mountain and road bikes as well as the behind-the-seat triathlon position. Speedplay, Inc. designs and manufactures user-friendly, high performance pedal systems for road and off-road cyclist. For more information about Speedplay pedals, call 858/453.4707 or visit Speedplay.com.